In the heat of the summer, we're very aware that some plants take the heat better than others - and that some need more water than others to stay perky. Mother Nature reminds us through soaring temps that we need sustainable plants that are heat-lovers, aren't super thirsty - and also do their job of catering to pollinators who are active this time of year. July and early August are prime hummingbird feeding times. Rufous hummingbirds (the coppery-colored ones with attitude) are traveling through, and the broadtails, calliopes and black-throated hummingbirds are preparing to migrate south so need lots of fuel for their travels. Does your garden offer flowers that will provide them with natural and more nourishing food than just plain sugar water? 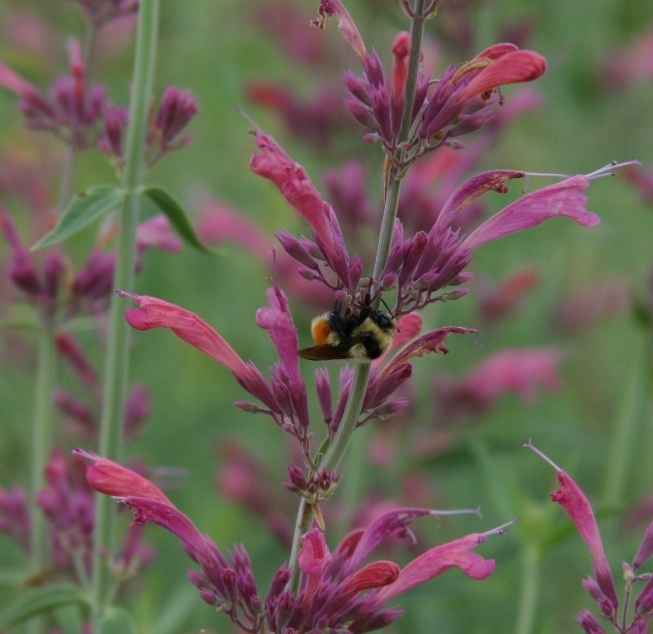 Bees and bumblebees are also most active in the heat of summer. We need them around to help vegetables and fruits produce abundant yields, so we need to offer them a wide assortment of summer-blooming perennial flowers and groundcovers. Luckily in Colorado, there's a wide range of perennial flowers that thrive in the extremes of summer, providing color and wildlife benefits during our hottest, driest months. Hyssops (Agastaches) - pictured above: This group of southwestern native perennials come in a range of colors and sizes, blooming from July through early frost. Sunset hyssop (A. rupestris) is one of the most dependable, and has orange/pink tubular flowers with narrow, blue-green leaves that smell like root beer when crushed. It grows to about 2' tall and 12-16" wide. Penstemons: Most penstemons bloom early in the summer, but Bridges' penstemon (P. rostriflorus) is just getting going in the heat of summer. The orangey-red flowers are narrow and tubular, just perfect for hummingbirds' tongues, and the stems are wispy and airy. This is a cold-hardy, long-lived summer-blooming penstemon growing 28-32" tall and about 24" wide. As with most penstemons, be sure to plant Bridges' penstemon in a well-drained soil with moderate to low amounts of organic matter. 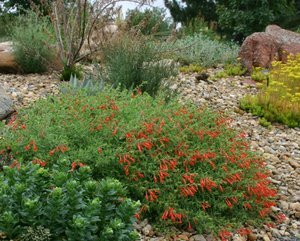 Orange Carpet®: Another hummingbird favorite is Orange Carpet® hummingbird trumpet (Zauschneria garrettii), a selection from northern Idaho that forms a low-growing mat of medium green and is covered with 2" orange-colored, trumpet-shaped flowers in midsummer. Very cold hardy and long-lived, Orange Carpet® will spread to 2' wide or more but is less than 8" tall. This heat-loving groundcover will thrive in most sunny spots with good drainage. Try planting it on the edge of a rock wall so it can cascade over the edge. 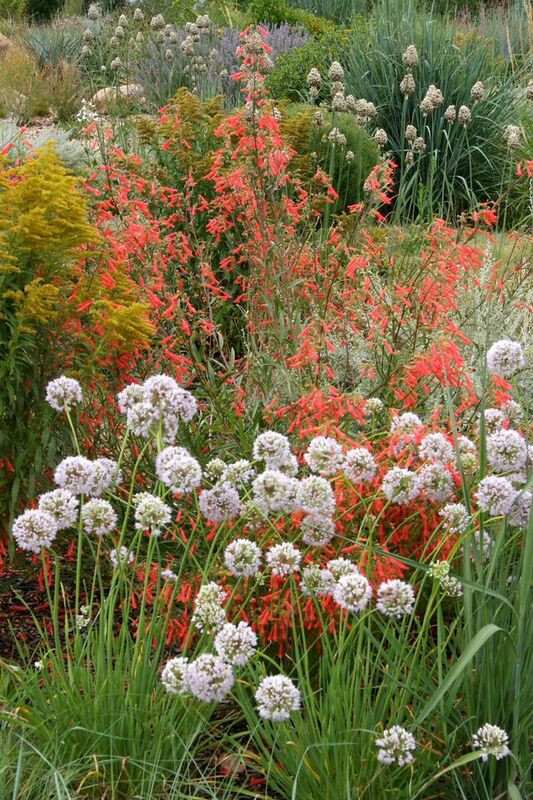 There is still time in this growing season to plant these and other perennials that do more than sit pretty. Perennials that multi-task add outdoor beauty, provide food for pollinators and thrive in the heat without requiring an abundance of water. We all probably need more of them in our yards.